PHILADELPHIA, Pennsylvania, February 9, 2011 (ENS) – To accelerate construction of a national high-speed intercity passenger rail network, the Obama administration plans to invest $53 billion over six years, Vice President Joe Biden announced Tuesday. 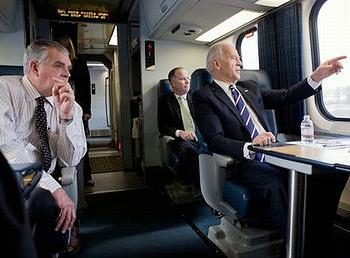 The vice president made the announcement with Transportation Secretary Ray LaHood during a visit to Philadelphia’s historic 30th Street Station, where passengers traveling from Pittsburgh and Harrisburg on Amtrak’s Keystone Corridor connect to high-speed Acela service to Boston, New York City, and Washington, DC. Biden said the investment will help the nation reach President Barack Obama’s goal of giving 80 percent of Americans access to high-speed rail within 25 years, as outlined in his State of the Union address on January 25. “As a long time Amtrak rider and advocate, I understand the need to invest in a modern rail system that will help connect communities, reduce congestion and create quality, skilled manufacturing jobs that cannot be outsourced. This plan will help us to do that, while also increasing access to convenient high speed rail for more Americans,” said Biden who for years has commuted by train from his home in Wilmington, Delaware to Washington, DC. Since track improvements raised speeds between Harrisburg and Philadelphia to 110 mph in 2006, the Keystone Corridor has seen rail ridership rise by 57 percent. Today, more passengers travel by rail than by plane from Harrisburg to Philadelphia, and onward to New York City and Washington, DC. This long term commitment builds on the $10.5 billion down payment the Obama administration already devoted to a national high-speed rail system, including $8 billion of Recovery Act funds and $2.5 billion from the 2010 budget. Biden said the proposal streamlines the Department of Transportation’s rail programs, making it simpler for states, cities, and private companies to apply for grants and loans. For the first time, all high speed and intercity passenger rail programs will be consolidated into two new accounts: a $4 billion account for network development, focused on building new infrastructure, stations, and equipment; and a $4 billion account for system preservation and renewal. This second account will be used to maintain state of good repair on Amtrak and other publicly-owned assets, bring stations into compliances with the Americans with Disabilities Act, and provide temporary operating support to crucial state corridors while the full system is being built and developed. Biden said that “strong Buy American requirements” will create tens of thousands of jobs in construction, manufacturing, and rail operations. The administration expects this investment will open the door to new public-private partnerships, and attract significant private investment in developing and operating passenger rail corridors.